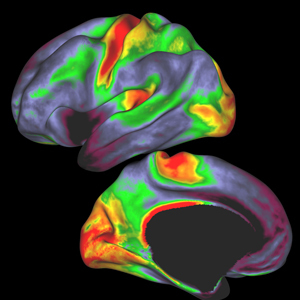 Such maps, previously only available via dissection, help scientists detemine precisely where they are at in the brain. Red and yellow indicate regions with high myelin levels; blue, purple and black areas have low myelin levels. The technique makes it possible for scientists to map myelination, or the degree to which branches of brain cells are covered by a white sheath known as myelin in order to speed up long-distance signaling. It was developed in part through the Human Connectome Project, a $30 million, five-year effort to map the brain’s wiring. That project is headed by Washington University in St. Louis and the University of Minnesota. Easy access to detailed maps of myelination in humans and animals also will aid efforts to understand how the brain evolved and how it works, according to Van Essen. 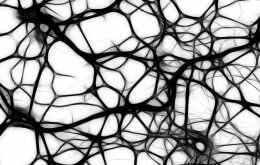 Neuroscientists have known for more than a century that myelination levels differ throughout the cerebral cortex, the gray outer layer of the brain where most higher mental functions take place. Until now, though, the only way they could map these differences in detail was to remove the brain after death, slice it and stain it for myelin. Washington University graduate student Matthew Glasser developed the new technique, which combines data from two types of magnetic resonance imaging (MRI) scans that have been available for years. As in prior studies, Glasser’s results show highest myelination levels in areas involved with early processing of information from the eyes and other sensory organs and control of movement. Many brain cells are packed into these regions, but the connections among the cells are less complex. Scientists suspect that these brain regions rely heavily on what computer scientists call parallel processing: Instead of every cell in the region working together on a single complex problem, multiple separate teams of cells work simultaneously on different parts of the problem. Areas with less myelin include brain regions linked to speech, reasoning and use of tools. These regions have brain cells that are packed less densely, because individual cells are larger and have more complex connections with neighboring cells. According to Van Essen, the technique will make it possible for the Connectome project to rapidly map myelination in many different research participants. Data on many subjects, acquired through many different analytical techniques including myelination mapping, will help the resulting maps cover the range of anatomic variation present in humans. “Our colleagues are clamoring to make use of this approach because it’s so helpful for figuring out where you are in the cortex, and the data are either already there or can be obtained in less than 10 minutes of MRI scanning,” Glasser says. Glasser MF, Van Essen DC. Mapping human cortical areas in vivo based on myelin content as revealed by T1- and T2-weighted MRI. The Journal of Neuroscience, Aug. 10, 2011. This research was funded by the National Institutes of Health (NIH).